From a turn of the 20th century postcard. This intersection was known as Memorial Square. 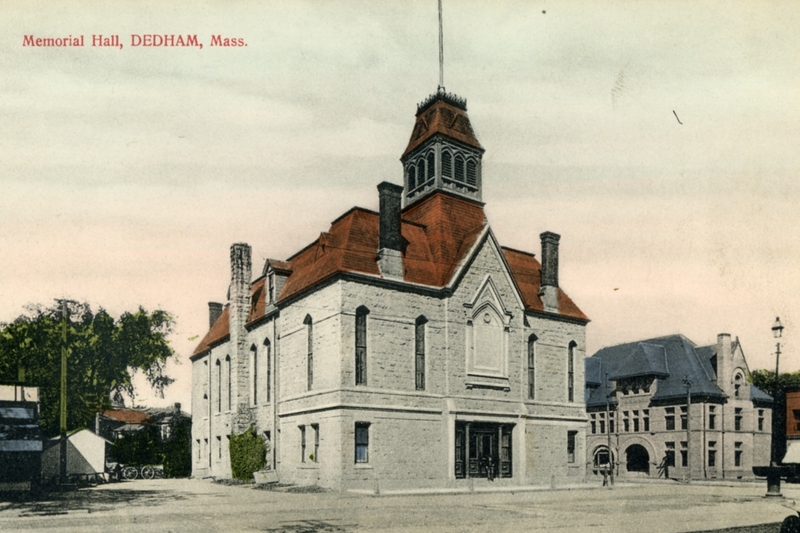 Memorial Hall was dedicated on September 28, 1868, as a lasting monument to the bravery of the forty-seven “sons of Dedham” who perished in the Rebellion, or Civil War as it is known today. It was made of Dedham granite, quarried just down the road in what is now Westwood. There were shops on the ground floor, with town offices and a large auditorium upstairs. Marble tablets bearing the names of the honored dead were placed in the vestibule. In his dedicatory remarks, hsitorian Erastus Worthington pronounced “Let this our Memorial Hall receive a benediction from us all today, God keep it ever from the lightning strike and the consuming fire.” The building was unceremoniously taken down in the spring of 1962, and the current police station built on the site. 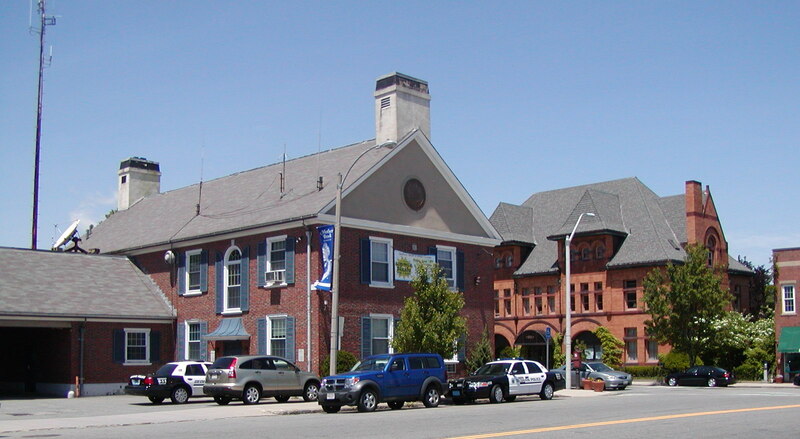 A new town hall was built on Bryant Street, and the marble tablets from Memorial Hall were placed in the lobby of the new building. This entry was posted on May 30, 2010 at 5:41 pm and is filed under Dedham Then and Now, Lost Dedham. You can subscribe via RSS 2.0 feed to this post's comments. You can comment below, or link to this permanent URL from your own site.